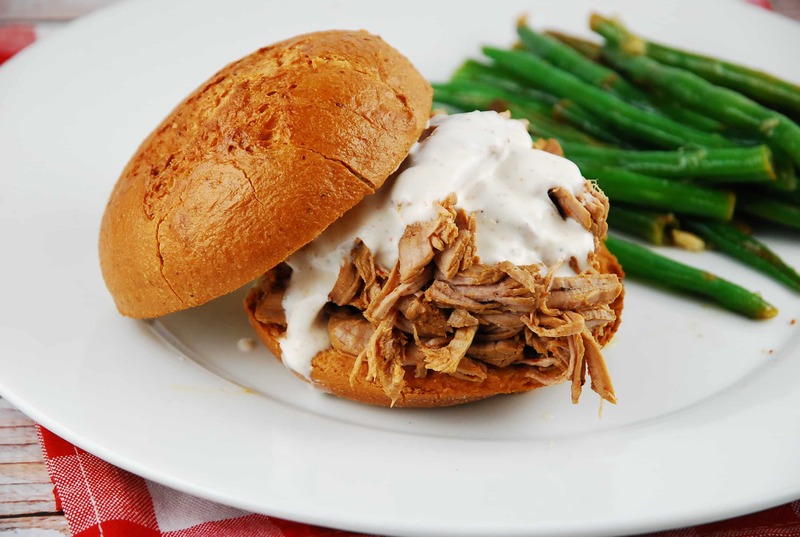 For those of of you who may have never cooked a pork tenderloin before, this Pulled Pork Sandwich Recipe with White Barbecue Sauce will be one of the easiest you’ve ever made. The pork is cooked to juicy perfection in just an hour. It’s simmered in a broth that has been well seasoned and flavored, then shredded and smothered in a creamy, tangy, white barbecue sauce. It’s a very lean cut of meat that delivers an incredible flavor, which allows for a bit of indulgence with a carb-heavy sandwich roll. You could shave off a couple of Points by using a sandwich thin with this Weight Watchers Pork Recipe, if you prefer, but I like it best with a nice big hearty roll – totally worth those coupe of extra Points. Enjoy! These pulled pork sandwiches taste way too good to be just 9 Points. Tender, juicy, succulent pork tenderloin smothered in a creamy white BBQ sauce, is sure to make your mouth happy. In a small bowl, combine mayo, yogurt, lemon juice, 1 1/2 tbsp vinegar, chipotle chili powder, garlic, and salt & pepper to taste. Mix well. Cover and refrigerate for at least 1 hour. Combine the 1/2 cup apple cider vinegar, chicken broth, brown sugar, paprika, chili powder, garlic powder and salt & pepper in a medium sized saucepan and set over medium high heat. Cut pork tenderloin into large chunks, place in saucepan, cover, and reduce heat to a simmer. Cook for 1 hour or until tender. Remove pork from cooking liquid and shred with 2 forks. Place pork back into cooking liquid. Top 1/2 of each sandwich roll with 1/6th of the pork. Then top with 1/6th of the white barbecue sauce. Add remaining 1/2 of sandwich roll on top. I tried this tonight and it is PHENOMENAL! To save time, I put the cooked pork into the food processor to shred for me. I liked that it was a finer texture due to this process, and in turn, makes it easy out to evenly measure the weight for the six portions. Thank you for the wonderful recipe! I will be keeping this. This looks amazing! My husband will be thrilled when I make these, he loves a pulled pork sandwich! I don’t have the WW app anymore, how many points would you say the buns are? I am planning on eating mine as a lettuce wrap. Thanks for all of your awesome recipes! Depending on which brand you use, I’d say the buns average 3-4 Points Plus of the 9 total. What is the P+ value of the roll? Depending on which brand you use, it’s about 3-4 Points Plus for the bun.